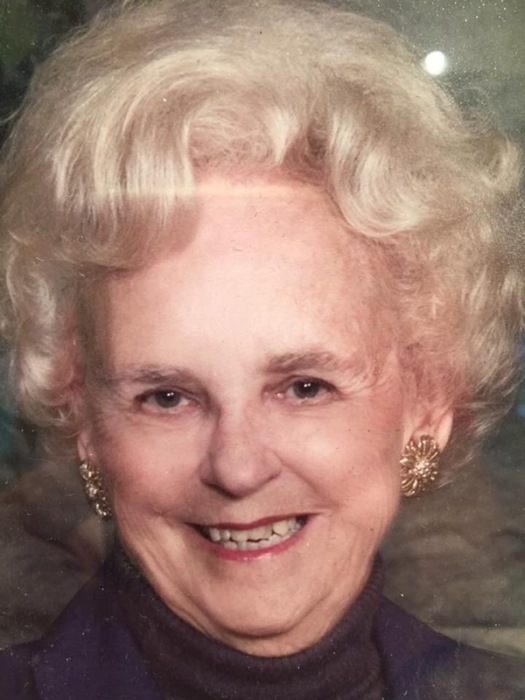 Obituary for Grace Marie Steiert | Drinkwine Family Mortuary, Inc.
Grace Marie Steiert "Grandma Michief"
Grace was preceded in death by her husband Clarence Steiert and their son David Steiert. Survived by children: James (Mary Jo) Steiert, John (Connie) Steiert, Robert (Jan) Steiert, Donald (Linda) Steiert, Thomas Steiert, Mary (Ryan) Rhinehart, Catherine (Bruce) Niemeyer, and Diane (Edward) Keely. Also survived by 16 grandchildren and 2 great grandchildren. When asked to describe her life, Grace said, “I lived a wonderful life surrounded by a loving family, by many loving friends, and most of all, by a loving God.” Grace, born in Leadville, was pious and Irish Catholic to her core. Party on Saturday and church on Sunday. While a junior at Denver’s South High School during WWII, Grace was given a diploma and a job repairing planes at Hill Air Force Base. Later, she was chosen to open Hill’s first library and then to be the librarian at Fitzsimmons Army Hospital, where she met and fell in love with a patient, Clarence Steiert. Grace’s greatest accomplishment was having and raising nine children, but her greatest joy came from her grandkids and great-grandkids with whom she had time to play. They gave her the well-earned nickname, Grandma Mischief. She was active in Littleton’s St. Mary Church for over fifty years where she formed many lifetime friendships. She loved everyone, so everyone loved her. Grace and Clarence were avid Bridge players, belonging to many Bridge groups and competing in tournaments around the state. When son David became a flight attendant for TWA, they were able to take numerous trips to Europe, where they stayed with locals, usually farmers, who rented rooms in their homes. Donations in Grace’s name can be made to the National MS Society or Catholic Charities of Denver. Recitation of rosary will be Friday 7:00 P.M. at Drinkwine Family Chapel with Funeral Mass Saturday 10:00 A.M. at St. Mary Catholic Church. A reception celebrating Grace's life will follow service at Columbine County Club. In lieu of flowers, please make donations to the National MS Society of Colorado https://secure.nationalmssociety.org/site/Donation2?df_id=55995&55995.donation=form1, Catholic charities or to the charity of your choice in Grace's memory.